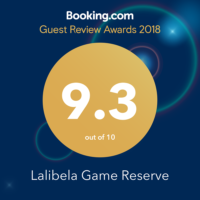 Guests come to Lalibela in order to combine experiencing great game-viewing with great food together with the chance to completely and utterly unwind. The safari part of a holiday to Africa is generally the highlight and we certainly do our utmost to ensure that our guests are able to relax, indulge and experience in style! Naturally the game-viewing is one of the most important aspects to a safari stay and in this respect we are governed by the rhythm and times of nature. Since predators are generally inactive during the daytime, most hunting is done in the early hours of the morning and late in the evening and because this is the time when predators are most active, the antelope also follow these times – they relax in the shade in the daytime and are alert and active in the early mornings and late evenings. For these reasons, our game drives take place in order to coincide with when the wildlife is most active – early morning and late evening! This does mean early starts, but guests soon get used to it and their body clocks adjust to Africa time remarkably well! We believe that warm hospitality and memorable food are as important as the game-viewing element of your safari experience. At Lalibela, food is true safari cuisine with an emphasis on local specialities, ranging from centuries-old recipes to exciting new contemporary African dishes. Dining at Lalibela is unforgettable whether it is brunch on a sunlit deck, or a safari cuisine dinner in an indoor dining room or outdoor boma. The atmosphere at our lodges is one of “relaxed informality” and we encourage interaction between guests at the dining table. Dining at all of our lodges, whether indoors or outdoors, is always around a large central table. The table is a place where our guests discuss the day’s activities with their ranger, make new friends from around the world or just enjoy the local tastes and flavours in a relaxed African setting. YOUR LODGE AT LALIBELA – YOUR BASE IN THE BUSH! Upon arrival at your lodge, your lodge manager will give you a welcome and a “do’s” and “don’t” talk – your lodge is in the Big 5 area and your safety is one of our primary concerns. Lunch is served at your lodge in the afternoon after which you depart on your first game drive – a sunset drive, returning after nightfall for a safari cuisine dinner. After dinner, you will have the opportunity to sit around the fire, have a drink and to chat with your ranger and other guests. The following morning you have an early morning wake-up call and a light breakfast is served before your early morning game drive begins. You will return from your morning game drive in time for a sumptuous brunch. You then have time to relax between brunch and afternoon high tea – this is the time to have a sleep, lie at the pool, read a book! Check-out from your lodge is after brunch on your day of departure when you are transferred back to reception. You get 2 game drives for each night that you stay with us (an evening game drive and a morning game drive) – we recommend that our guests stay a minimum of 2 nights, but ideally 3 nights, in order to get the most out of the safari experience.